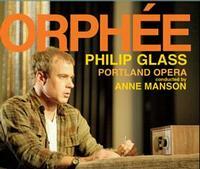 This year saw a milestone in the Portland Opera's history with their first-ever commercial recording, a complete rendering of Philip Glass's Orphee. Recorded during Orphee's run in November of 2009, the surprise hit of Portland Opera's last season transfers admirably to this disc from Orange Mountain Music. Not only is this CD a first for the PO, but it is doubly important in that it is also the first complete recording of this opera, the last of Glass's triptych based on films by Jean Cocteau to be put to disc. The production benefited from the previous experience with this work brought to the fore by conductor Anne Manson and principals Philip Cutlip (Orphee) and Lisa Saffer (La Princesse), all of whom performed this previously with the Glimmerglass Opera. The recording succeeds brillantly in capturing the crispness and concision of the dialogue, which was adapted by Glass from the script for the 1949 Cocteau film of the same name. Cutlip's rich, expressive baritone and soprano Lisa Saffer's moody Princesse seem to leap out from the recording with their sincerity and intensity. The dialogue moves along as in a film; i.e. no long expressive arias, so the singers have the challenge of both continuously advancing the plot while delivering enjoyable listening from a musical standpoint. The oft-mysterious framework provided by Glass's orchestral underpinning comes through in delicious color, from the hurly-burly French cafe music to be found in the opening scene to the dark mystery of the journey to the underworld, and the ceaseless movement of the music seems to command rapt attention. Particularly poignant are the tender moments between tenor Ryan MacPherson as Heurtebise and Georgia Jarman as Eurydice, Orphee's sometimes-scorned wife, as well as Orphee's obsessive madness with the cryptic radio broadcasts that he takes to be the finest poetry in the world. The heart-rending decision by Heurtebise and La Princesse to defy the will of the underworld and return their loves to their former lives after the harrowing journey beyond the doors of death is as inspiring and beautiful as one could hope opera to be. As a side-note, the French diction is marvelously clear throughout. Portland Opera has distinguished itself by releasing such a meaningful, high-quality recording by one of the world's most important living composers. In short, this is a brilliant recording of a brilliant work. It is one that will bear repeated listening, with new facets to be discovered at each turn. On October 30, 1935, the Composers' Forum-Laboratory, designed to provide an outlet or American composers during the Great Depression, opened in New York with a program of music by Roy Harris. The Forum was an outgrowth of the Federal Music Project, a division of the Work Projects Administration, which was established as a national agency on May 6, 1935, by an executive order of President Franklin Delano Roosevelt. At its peak in 1936, the FMP, which began as a distinct division of the WPA on August 1, 1935 as a means to provide work for unemployed American musicians, involved a total of 15,000 musicians. Even though the newly renovated Lincoln Recital Hall is getting all the raves, it's actually not the newest improvement in Portland's performance landscape. The latest addition in performance spaces belongs to Rose City Park Presbyterian Church (1907 NE 45th Avenue), which has dramatically altered its sanctuary so that its acoustics are much, much better for concerts. I got to experience that first-hand when I sang with the Bach Cantata Choir in its first concert of the season on Sunday afternoon. The choir could hear each other and the orchestra way better than before, and the audience thought that our sound was much better as well. In any case, other groups should consider looking at this space for future performance opportunities. This Sunday (October 24) at 2 pm, the Bach Cantata Choir will perform two Bach cantatas plus works by Heinrich Schütz and Christoph Graupner. The choir’s artistic director, Ralph Nelson, will conduct the concert, which will features soloists and chamber orchestra. The performance will be held at Rose City Park Presbyterian Church (1907 NE 45th Avenue). During intermission and after the concert a silent auction will also take place. I will be singing in this performance as will fellow-NW Reverber Lorin Wilkerson. BTW: Today at our dress rehearsal, Ralph Nelson asked the choir to sing the Graupner with a lighter voice, and said something like "the Graupner sounds too heavy!" One my tenor colleagues, Josh Kadish, whispered to me "He ain't, he's my Graupner." I recently attended a Portland Baroque Orchestra concerts (see my review in Oregon Music News) and noticed that principal second violinist Rob Diggins's chair had a cushion atop a dual-stack of hymnals. It looked sort of uncomfortable, but it didn't seem to hinder Diggins's playing at all. Still, it might be better for him, if the right kind of chair could be used. Melinda Bargreen in Musical America has written a report on the troubles at the University of Washington School of Music. A $230,000 deficit has caused the school to trim staff. Bargreen states that "many are part-time, including those held by internationally known Wagnerian soprano Jane Eaglen and noted trumpeter Allen Vizzutti. A third departure, a resignation last month by assistant voice professor Joyce Guyer (a 16-year veteran of the Metropolitan Opera), came in the wake of Guyer’s belief that the new School of Music Director Richard Karpen would not recommend her for tenure. Vizzutti and Guyer made their dismay known in letters that have been widely circulated on the Internet." This news item in Musical America may be available only to subscribers. I have a subscription to Musical America (discounted through my membership in the MCANA). I only got to hear the end of tonight live broadcast of the Los Angeles Philharmonic's gals - carried on KQAC 89.9 - and I heard David Buck's solo passages in Márquez's "Danzón No. 2." You may recall that Buck was the principal flutist of the Oregon Symphony from 2005 through the end of last season. Now Buck is Mr. Dudamel's number 1 piper, and he sounded really terrific over the radio. The broadcast commentators noted that at the end of the Danzón, Dudamel signaled special attention for several members of the orchestra and Buck was mentioned. Bravo! 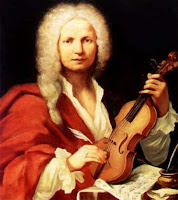 Exciting news from Scotland: a Vivaldi flute concerto called "Il Gran Mogol," which was known only by its reference in the catalog of an 18th-century Dutch bookseller, was discovered in the National Archives in Scotland. It was missing only the second violin part, which has been reconstructed. Its first-ever performance will be in Perth in January. Read more about it here. Classical Millennium, Portland's classical-only CD store, is pleased to present In Mulieribus in live performance. Join this early music choir of seven women at the store, 3144 East Burnside in Portland, on Saturday, October 9, from 2:00 - 3:00 P.M. to hear them perform excerpts from their new album, A December Feast. All In Mulieribus recordings will be specially sale priced for the event. 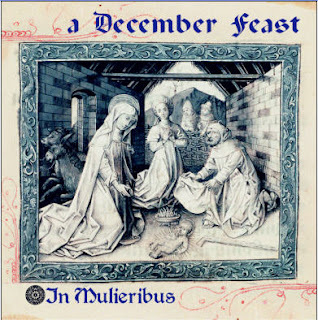 This new CD, A December Feast, is the third in the group's series of self-released discs, and will feature music for the various feasts in December, including of course, Christmas. The two previous recordings were featured as Critics' Picks in The Oregonian newspaper. The first, Notre Dame de Grâce, presents conductus compositions from the late twelfth century, and the second, In Mulieribus: LIVE, is a compilation of live recordings from concerts between 2004-2008. Founded in 2004, In Mulieribus (the Latin phrase meaning “amongst women”) is a female vocal ensemble that focuses on works written primarily before 1750, without instrumental accompaniment. In Mulieribus (IM) presents its own annual concert series in Portland, Oregon, and has also appeared as guest artist at the Portland Art Museum, the University of San Diego, and the Multnomah County Library. Upcoming performances include the 2011 Abbey Bach Festival at Mt. Angel Abbey in St. Benedict, Oregon, and the Linfield Lively Arts Concert Series at Linfield College. From its inception, the mission of In Mulieribus has included both an artistic and philanthropic component. Unique among performing arts groups, a portion of all concert proceeds goes to benefit another non-profit organization that serves the community. Performances by In Mulieribus have been broadcast on nationally syndicated radio shows such as Performance Today and Millennium of Music. The ensemble has recently reached beyond its focus on early music, to highlight works by women composers and to support new music. Frajola sings and plays at the same time! Every year, the Oregon Symphony opens its first regular classical music concert with the national anthem, and I noticed at the opening concert on Saturday evening that associate concertmaster Peter Frajola was singing the national anthem and playing it at the same time! I took a quick look at other members of the orchestra, but I didn't see anyone else doing this (of course, wind and brass players cannot do this feat), and perhaps Frajola has been doing this for years. In any case, kudos to Frajola!